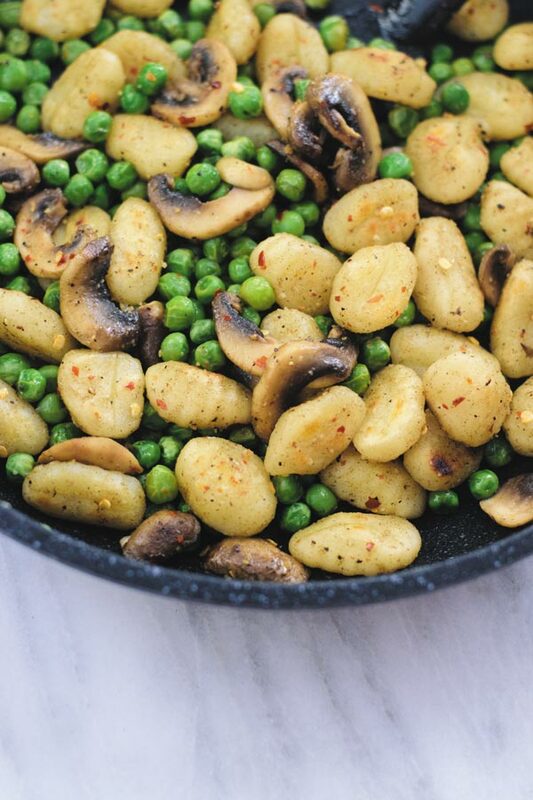 A simple yet satisfying weeknight dinner – One Pan Peas & Mushroom Gnocchi. All cooked in 30 minutes in one pan! 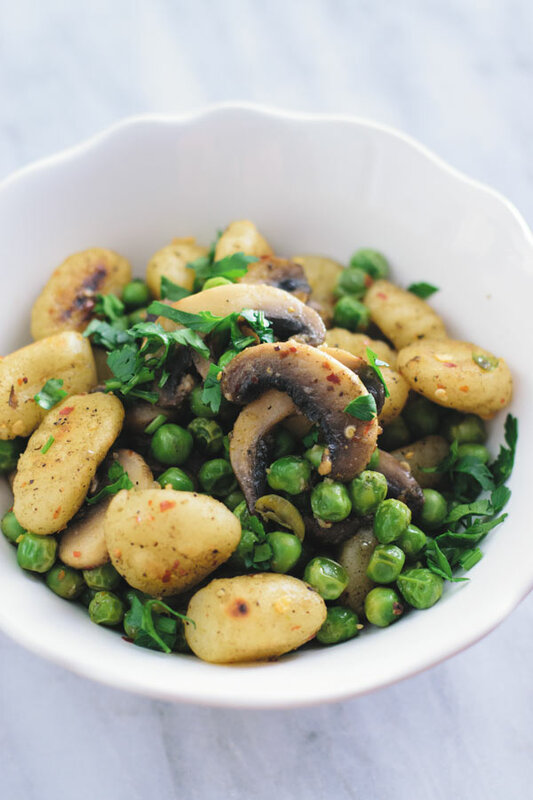 Crispy buttery gnocchi, peas and mushrooms in thyme scented butter. Soft pillowy gnocchi in thyme scented butter sauce. And if that wasn’t enough, we throw it into a mix of perfectly cooked mushrooms and peas to make a meal so simple yet so elegant. All you need is 30 minutes, one pan and just few ingredients to make this restaurant worthy dish in your very own kitchen. And it’s meatless too for days when you just can’t look at another meat based recipe! For us carbs are always an important part of meal. Even though we try to avoid carbs, they find their way into our meals and I would be lying if I say that we don’t enjoy them. Actually we both love carbs and for me until I eat carbs with my meal, I feel I am still hungry! These days I find myself short on time especially when it’s suddenly dinner time and I find myself staring into my fridge for some inspiration. I know, we food bloggers have difficulty figuring out dinner too. So I am trying to perfect more simple, 30 minutes, possibly one pan recipes that require few ingredients but are hearty and big on flavors! And btw have you realised how fast time flies these days? I mean it was just New year’s recently and now we are so very close to Valentines day and when I realised that today, it made me think how I haven’t created any V-day recipes yet this year! I think this year I am more than happy just eating warm cozy bowls full of these soft pillowy gnocchi. I mean who would mind this?! RIGHT!! So as I was saying this magic pasta starts with store bought gnocchi (I mean hats off to you if you are making your own gnocchi – please send some over here!) But for now this lazy girl is happy using store bought gnocchi which is first crisped in butter. Then mushrooms and peas are cooked in thyme scented butter and everything is tossed together with some salt, black pepper, red chili flakes and little lime juice! It’s so good straight out of the pan and I might have eaten half of it just in the name of taste testing! oops! In a pan, melt 1 tbsp butter. To it add gnocchi and crispy it up on both sides. Keep it aside. In the same pan, add 1 tbsp butter and 1 tbsp oil. To it add mushrooms and let them cook for 5 minutes until slightly cooked. Add green peas, salt, pepper, red chili flakes, thyme and stir. Cook for another 4-5 minutes. Add gnocchi and stir. Cook on medium-high for 7-10 minutes. Taste and squeeze lime juice. Oh, gnocchi!! I love it so much and I never make it – WHY IS THAT? Thanks for the reminder and for your scrumptious recipe. Gnocchi is just so darn delicious! Love the addition pf peas here for freshness and colour. Yum! Yes yes please try this Blair!! It’s seriously so simple but with so much flavors!! 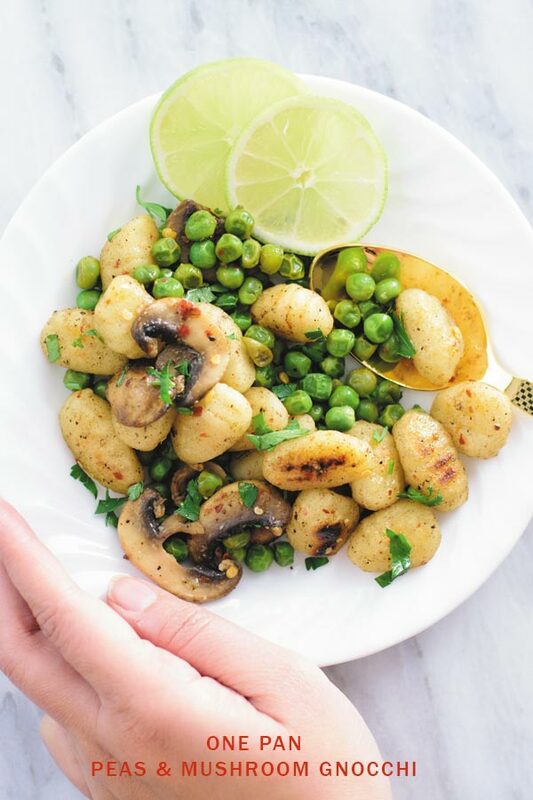 These gnocchi look absolutely scrumptious – love those crispy edges, and the mushrooms and peas make it even more flavorful! These look beautiful and delicious, Amishi .Love the idea of mixing all of these ingredients together!